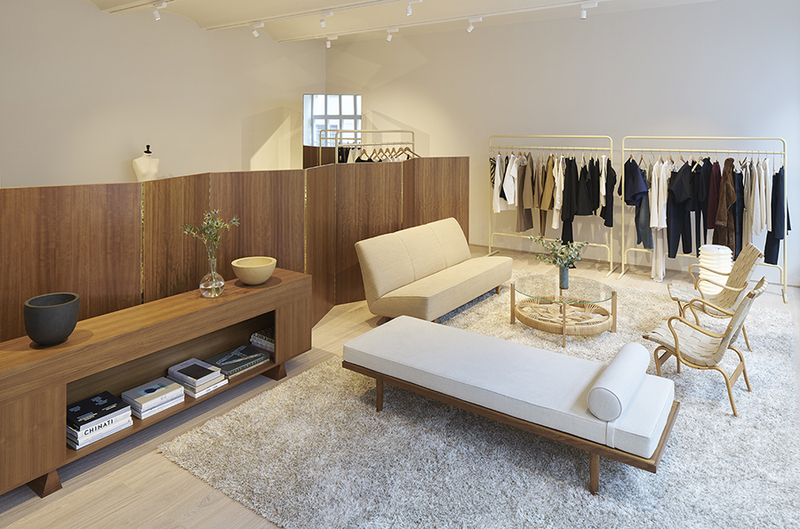 The co-founders of Totême, Elin Kling and Karl Lindman, talk about the brand's DNA, their first retail space, and what it's like to work together as a married couple. Every day we ask a designer to take a selfie and give us an inside look at their lives. Describe what you make: From our design studios in Stockholm we design and make ready-to-wear collections for the modern woman on-the-go. The most important thing you’ve designed to date: The brand DNA of Totême. We believe that it is crucial today to have a clear point of view and sense of direction that transcend seasonal collections. The problem your work solves: We are married, so work is intertwined with our personal lives in many ways. We love it and wouldn’t want to have it any other way. Perhaps it’s not the ideal setup for many couples, but it’s working for us. We like to think that Totême stands for something very authentic – simply because we care and invest so much of ourselves into the brand, our team, and the design of our collections. What you are working on now: We are currently working on our next fall collection and, additionally, have plenty of fun, exclusive drops hitting our website soon. Describe a new or forthcoming project we should know about: In addition to our design studio, we opened our first physical retail space (inside the Stockholm department store Åhlens), designed in collaboration with Swedish designer Christian Halleröd, just last fall. It’s an exciting milestone for us, so please come by and visit if you are around! What you absolutely have to have in your studio: Our fabulous team and playlists from our in-house DJ, Jacob. What you do when you’re not working: We travel a lot – seeing things, meeting people– but most of all hanging out with our 2-year-old daughter, Liv. Sources of creative envy: We recently visited Fäviken, a restaurant far up north in Sweden, and were blown away by the cusine and the world they have created from scratch in the middle of nowhere. Very inspiring and a wonderful experience. The distraction you want to eliminate: The constant headlines involving American politics.